Most, ok all of my clients offer a cocktail hour for their guests between ceremony and reception. I love adding a signature drink, fun cocktail napkins and maybe personalized stirrers. what about doing something fun for after dinner drinks? 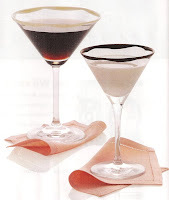 Spruce up the coffee station by offering Sambucca, Baileys or Peppermint schnapps with coffee. -Melt semisweet or white chocolate in microwave to get thin. -Hold glass at angle and rotate rim of glass in chocolate. Repeat around glass and make sure its even.